Born in Austria, Bertha Halozan emigrated to the United States in 1954. She first went to Chicago to work as a nanny but was not happy and had trouble with English, She moved to New York to pursue a career as a singer and did facials at Helena Rubenstein. She then worked as a physical therapist at several venues and eventually gave up her career as a singer because “I got a lot of publicity but very little money.” She began painting in 1978 during her rehabilitation following a stroke. Bertha generally painted repeated subjects – “a pigtailed, blue-eyed Statue of Liberty, surrounded by the busy activities of daily life in New York” often including the Goodyear blimp and a Mets baseball player, John Franco. 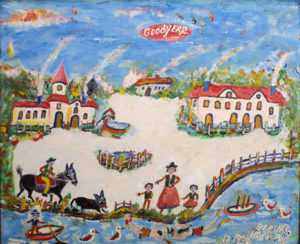 She frequently included a helicopter, and houses from an Austrian village with red tile roofs. For several years, she sold her paintings on a Manhattan street corner of Broadway and 55th Street near the residence hotel where she lived. She was rarely seen without bright red lipstick, most of it on her lips. 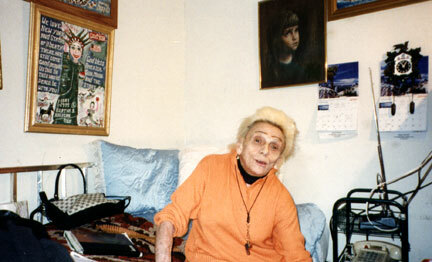 The reverse sides of her paintings chronicle Bertha’s life in New York. She glued and taped photocopies of old newspaper clippings that covered a tragic event in her life-her bridegroom not showing up and leaving her at the alter. Her reception went on nevertheless. Pictures on the back of her paintings include photographs and articles of her from various vocal recitals, including one at Carnegie Hall. Often a business card was glued among the collage of articles. Bertha died in 2004.